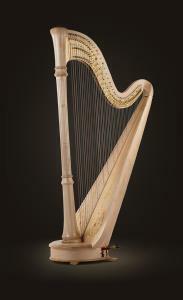 A contemporary harp designed by Lyon & Healy in 1985, the Style 85 is marked by its pure elegance. Subtle in design, the Style 85’s ornamentation is sparse, bringing focus to its fluted column, the fluid curves in the base and showcasing the classic harmonic outline of the harp. The soundboard is decorated with a beautiful climbing vine while the solid brass action plates feature restrained decoration. Image show a Style 85 CG in a Natural finish.